Rigid Industries, a leader in forward projecting LED lighting, partnered with Osram Opto Semiconductors to provide tough, extreme tested products for its new off-road night vision lighting series – the E- and SR-series. These new Rigid infrared (IR) night vision lights complement the full line of Rigid’s visible LED off-road lights. Both versions feature Osram’s high quality, high reliability, infrared LEDs (IRED) and visible LEDs. The new night vision systems from Rigid feature IR Oslon Black LEDs, supplied by Osram Opto Semiconductors because they are similarly tough with superior reliability. IR Oslon Black delivers IR illumination for night vision operation and, with more than 1W at 1A total optical flux, it is the most powerful single chip, high power IRED available today. Before the new products launched, Rigid engineers conducted a series of deliberately intense stress tests to prove that the lights can endure the most extreme real-world off-road conditions. To simulate what can happen when you mix hard-core off-road driving with intense dirt trails and harsh environmental elements, Rigid pushes its products to the breaking point to see how they perform through a series of abusive tests that include using hammers and saws. This type of testing ensures Rigid’s products far exceed the performance needed for a tough and reliable off-road lighting application. The IR Oslon Black is today’s smallest IRED with more than one watt of optical power and available with a wavelength of 850 nm and 940 nm. The small package with integrated lens allows compact arrangements of very high power density. This, together with its long lifetime, makes an attractive IRED solution required in off-road illumination. Off-road race teams and weekend riders choose Rigid because they trust their products will provide the best possible light and keep them safe at night. 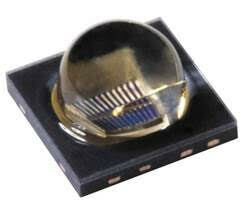 The IR Oslon Black SFH 4715S, the most powerful, single chip IRED available today. The Rigid Industries SR-Series night vision system. OSRAM, Munich, Germany is one of the two leading light manufacturers in the world. Its subsidiary, OSRAM Opto Semiconductors GmbH in Regensburg (Germany), offers its customers solutions based on semiconductor technology for lighting, sensor and visualization applications. Osram Opto Semiconductors has production sites in Regensburg (Germany), Penang (Malaysia) and Wuxi (China). Its headquarters for North America is in Sunnyvale (USA), and for Asia in Hong Kong. Osram Opto Semiconductors also has sales offices throughout the world. For more information go to www.osram-os.com. Rigid Industries® is a world leader in forward-projecting LED lighting. Rigid LED lighting products are used in aviation, agriculture, construction, emergency response, industrial, marine, military, mining, off-road and power sports. Rigid Industries® is committed to providing innovative technologies, and guarantees a quality product designed, engineered and assembled in the USA. For more information and a list of products, please visit www.rigidindustries.com or follow the company on Facebook, LinkedIn and Twitter.